(Nanowerk News) An international team of scientists, with Spanish participation, has shown for the first time that living organisms are able to manufacture biominerals with organisation of up to eight levels. The research focused on the skeleton of Mediterranean red coral, which has a crystalline order that is "almost perfect at nanometric scale" and could help in the development of new materials. "This research into red coral shows for the first time that biominerals (minerals synthesised by living beings) display a crystalline order made up of up to eight hierarchical levels of modules", Joaquim Garrabou, co-author of the study and a biologist at the CSIC Institute of Marine Sciences, tells SINC, "in which each module is made up of other smaller ones, and is in turn a component of other larger ones". Crystallographic organization of red coral. 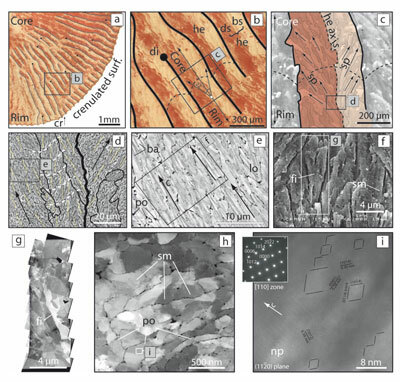 The study has been published in the latest issue of the journal American Mineralogist ("Multilevel modular mesocrystalline organization in red coral"), and was led by researchers from the Interdisciplinary Nanoscience Centre, in Marseilles, France, with collaboration from the California Institute of Technology (United States). The work focuses on red coral (Corallium rubrum), an invertebrate that lives in the rocky depths of the Mediterranean and Western Atlantic. The chalky skeleton of this coral, which has been highly prized for use in jewellery for thousands of years, is made up of "mesocrystals" of magnesium calcite. The term mesocrystal describes a three-dimensional crystalline organisation of nanoparticles within a larger structure. By observing these under electron microscopes (using both electron diffraction and transmission), the researchers were able to show that these crystals organise themselves into modules "aligned in a similar, but not necessarily identical, way". The results of the research show that a progressive transition takes place from a crystalline order that is "imperfect" at milimetric level to one that is "almost perfect" when the organisation of the crystals is observed at nanometric level. "The description of this modularity could be crucial to understanding the mechanisms involved in the construction of complex forms in biominerals based on elementary crystal units", says Garrabou. If the crystalline organisation observed in red coral can be extended to the biominerals in other living beings, this could prove to be vital to understanding how they manage to create such complex shapes in order to better adapt themselves to their environments. "The concepts developed in this study could also be very useful for designing synthetic crystalline materials with complex three-dimensional shapes, which is currently one of the challenges within materials science", points out Garrabou. The biologist has also taken part in another international study looking into the relationship between warming periods in the Mediterranean Sea (such as that caused by the 2003 heat wave) and mass mortality events among animals on the sea bed, including red coral. The researcher says that, against the current backdrop of climate change, "it is very likely that invertebrate populations will suffer more mass mortality events in the near future".